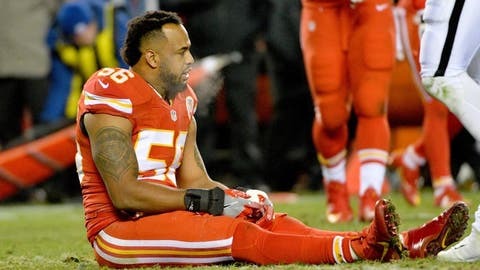 After tearing his Achilles tendon back on Dec. 6, Kansas City Chiefs inside linebacker Derrick Johnson believes he’ll be ready for training camp. Kansas City had a very difficult time stopping the run last year, with its only notable defender against it being Derrick Johnson. In Week 14 against the Oakland Raiders, even that was lost when Johnson tore his Achilles tendon, ending his season. For the 34-year-old, it was the second time in three years he sustained the injury, albeit this time to the other leg. On Friday, Johnson spoke with Terez Paylor of the Kansas City Star at Super Bowl week in Houston, explaining that he should be back on the field by training camp. Johnson is already out of his clunky walking boot and into a smaller one. The All-Pro then explained that he believes running is a possibility by OTAs, and that he could be back on the field by August for the start of camp. The Chiefs desperately need Johnson to be back and in top form for 2017. He has two years remaining on his deal, although Kansas City could get out easily after this season. If he returns and plays like the old D.J., we’re talking about the best in the business. Here’s to hoping Johnson can fulfill his own expectations, and help the defense improve.